**** Chosen by Winner: Royce T.
This Mid-Tech by Bob Terzuola features a tumble/satin finished 154CM spear point blade with swedge, thumbrest, flipper and a thumb disc. The handle has anodized and tumbled titanium scales with frag pattern, a single anodized and tumbled THICK titanium liner, copper backspacer and tip-up MILLED titanium clip with hidden screws. Bob Terzuola was born in Brooklyn, New York and attended New York University. Upon graduation in 1967 he went to Panama as a Peace Corps trainer and later became a jade carver and gemologist in the Motagua River Valley, Guatemala. In 1979, Terzuola began making knives and joined the Knifemakers’ Guild in 1981on an endorsement from Bob Loveless. Terzuola’s first knives were fixed blade designs made for soldiers in Guatemala. Later that year moved to New Mexico and began making folding knives. Seeing a need for a knife that could be carried discreetly, he developed a model featuring black micarta for the scales and bead-blasted titanium bolsters. Innovations in desgin for which he coind the term “Tactical Knife”. Bob Terzuola attends many of the largest and well known custom knife shows across the world. Bob Terzuola Knives are known for their trademark design and high quality workmanship. Terzuola’s most popular model is the ATCF, a folding knife design. This was his first tactical folding knife, although he also makes it with non-tactical materials. 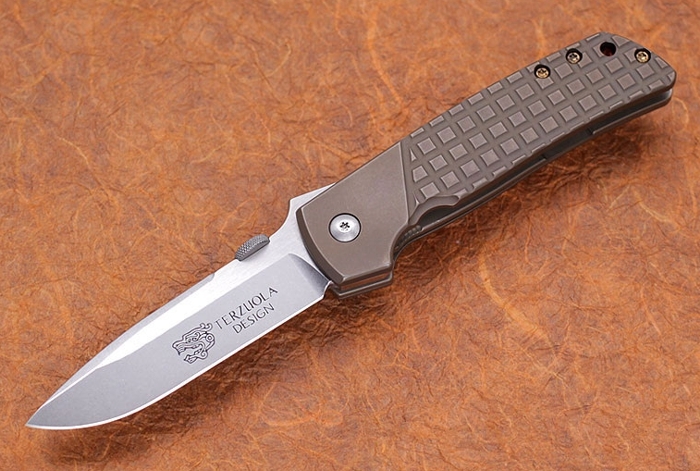 KnifeArt.com and Bob Terzuola have collaborated on projects such as the limited edition EXTF tactical folding knife. The KnifeArt.com exclusive EXTF was limited to 20 knives. Other knife models that Bob Terzuola is popular for are the 3A, TT-1, Model 7, Eagle Rock 514, TTF3A, Model 26, Starmate, TTF3B, Pathfinder, Century Starfighter, Starmate, Battle Guard, TTF6, Model 18 Combat Master, WEE T, and Battle Mate, just to name a few. Bob Terzuola also designed a very popular knife that for Spyderco, the SLIPIT. The SPLIT is made of the finest non-locking tactical folders on the market. Bob Terzuola has authored a book about the design of tactical knives named, ‘The Tactical Folding Knife.’ When you hear people say that Bob Terzuola literally wrote the book on tactical folding knives, he really did! Many custom tactical knifemakers have his book in their shop, and highly value his opinions and designs. Bob Terzuola has also authored articles about tactical knives and knifemaking for Blade, Soldier of Fortune and other publications. Bob Terzuola has collaborated with other custom knifemakers and production knife companies.